A troubled union of two artistic temperaments feels “the powerful effects of music on our emotions,” in an elegant short novel from the internationally acclaimed Dutch author (Duke of Egypt, 2002, etc.). De Moor’s story is a subtly elusive composition centered in two meetings, ten years apart, between the unnamed narrator, an earnest musicologist, and Marius van Vlooten, an unusually self-reliant blind music critic. They first meet when stranded together at an Amsterdam airport while awaiting a delayed flight to Bordeaux, where both are to attend a master class for string quartets. Van Vlooten reveals the cause of his blindness (a botched suicide attempt, over a failed love affair). 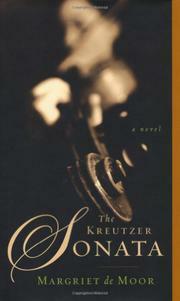 The narrator introduces the critic to beautiful young violinist Suzanna Flier. As he later learns, the two fall in love and wed, but endure a tempestuous marriage marred by her casual (possibly adulterous?) relations with colleagues and his seething jealousy—in a manner echoing the plot of Tolstoy’s mordant novella The Kreutzer Sonata (inspired by a Beethoven chamber work and itself the source of Leos Janacek’s 1927 string quartet, which Suzanna performs, brilliantly). The details of “this spiral of passion and fate” emerge when the two men cross paths a decade later, as each is en route to the Salzburg Music Festival. The story is then concluded “sixteen years later” as the narrator—alone this time aboard an airplane—reads a newspaper account of the incident that ended the tortured “sonata” played (as it were) by Suzanna and Marius. It’s a deliciously conceived and executed mystery, seasoned with acute perceptions of how both music and life are seen, heard, and imperfectly experienced and understood by whatever senses humans command. And it’s a strikingly ingenious homage to the great originals (and copies) of Beethoven, Tolstoy, and Janacek. De Moor is rapidly becoming one of the world’s finest novelists.